Another year, another release of Solidworks. 2016 will bring a mix of incremental upgrades (an updated move triad!) and a few new features. This article is an update from my workstation build last year. Not a whole lot has changed regarding a workstation build but it’s time to start considering Windows 10 and a beefier CAD GPU. Overall there have been minimal performance relevant changes in 2016 and most of the hardware remains the same. The core of a good Solidworks workstation is still a fast CPU, lots of RAM, and a Solidworks approved workstation graphics card. Every engineer should enjoy the great outdoors and after a recent backpacking trek I wanted to share my gear selections. Backpacking can be a very expensive hobby if you buy top-notch gear across the board but its very affordable if you look at mid-range items. There is a ton of gear available online and there are plenty of deals to be found on clearance stock. 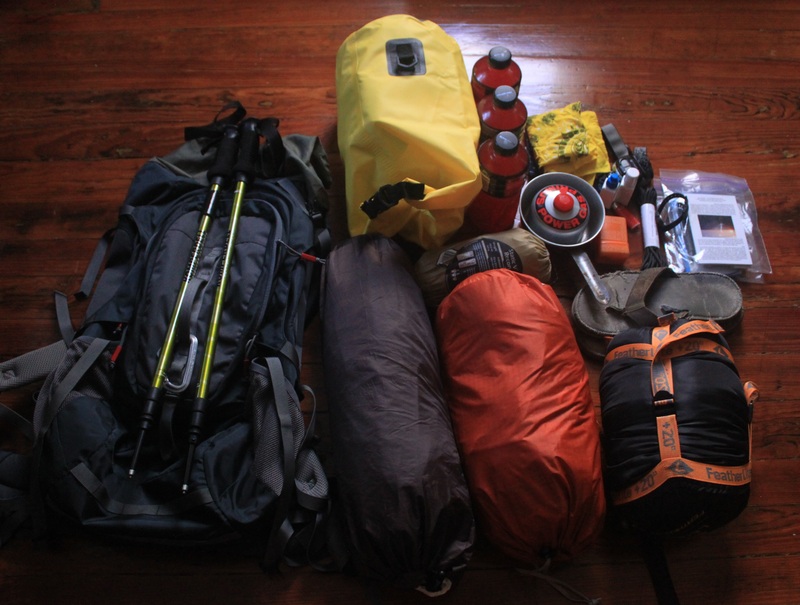 Gearing up for a multi-day trek can be cheaper than a plane ticket somewhere. Backpacking can be a very inexpensive vacation when you start considering the travel and hotel costs of a traditional vacation. What’s better, a week backpacking in the mountains or a short weekend at an Orlando Holiday Inn? Here is my loadout for a recent venture on the Black Forest Trail. Backpack – Kelty Pawnee 55 – A great and well rounded pack that has unfortunately been discontinued. The mid-size volume is a nice fit for most backpacking treks. I would consider the Osprey Exos 58 as an alternative. Boots – Montrail Fluid Trailrunner – A bit of a misnomer here, these are trail running shoes and not hiking boots. Very capable for almost all treks – you’re trading the ankle support of a heavy boot for lightness, flexibility, and improved traction. These shoes have extra sticky patches on the sole that latch onto rocks and provide confident footing. Trekking Poles – Komperdell Shockmaster – Essential gear for back packing, trekking poles provide stability and reduce knee impact when going downhill. These are lightweight and have a cushioning system to reduce overall impact when descending hills. Tent – ALPS Zephyr 1 – Inexpensive, freestanding, and relatively lightweight. Plenty of internal room and overhead space. The zipper pulls are functional but leave something to be desired. Ground Pad – Tyvek Sheet – Lightweight, strong, and waterproof. I custom cut mine to fit the Zephyr footprint. Very noisy until you give it a good crumple and introduce creases. Sleeping Bag – Ledge Sports FeatherLite – An Amazon bargain, this is comfortable and inexpensive. Compresses well too. Sleeping Mat – Klymit Stativ V – Worth every penny. Lightweight and packs in a tiny stuff sack. Extremely comfortable after a long day of hiking. The center of the pad near the top has a nice triangle section that works well as a pillow. Stove – Etekcity Ultralight Stove – This is a lot of stove for $10. Works great although you may want to consider an external stand if you’re working with larger pots – the stove has a small footprint and you need to carefully balance larger pots to make sure they won’t tip. Food Sack – OR 20L Ultralight Dry Sack – Plenty of room for 4+ days of food. Easy to hang if necessary (pesky bears) and the waterproof nature helps seal in most of the food aromas which should reduce animal attention. Stuff Sack – OR 15L Stuff Sack – 15 liters is the perfect amount of room for a change of clothes, extra socks, and warm weather gear. Keeps everything contained and makes packing much easier. Underwear – ExOfficio Boxer Briefs – Amazingly comfortable, these are a vacation in itself. Synthetic clothing is a must for backpacking and sweating, avoid cotton at all costs. Socks – Darn Tough Merino Wool – Bulletproof and comfortable. Fast drying for when you dunk your boot in that stream crossing. The durability of these make them worth the money. Flip Flops – Teva Mush Flip Flop – A trail luxury but completely worth it. It’s nice to give your feet a break and kick off your boots any opportunity you get. I like to wear these if I stop for a long lunch break somewhere and these are my primary footwear in camp. Gaiters – OR Rocky Mountain Gaiter – Perfect for the high brush you’ll encounter along the trail or any situation where you need long pants but prefer shorts. Jacket – North Face Momentum Jacket – This is made of a stretchy fleece fabric which makes it snug and extremely comfortable. Great for chilly early mornings and works as a great pillow at night. Rain Jacket – North Face Venture Jacket – The classic rain shell, everyone in Seattle owns one of these. Lightweight, tough, and compacts nicely. Inexpensive for the performance. Water – Aquamira Treatment Drops – If your water sources are of reasonable cleanliness I would recommend just using these drops, no filter. Much better taste than Polar Pure.